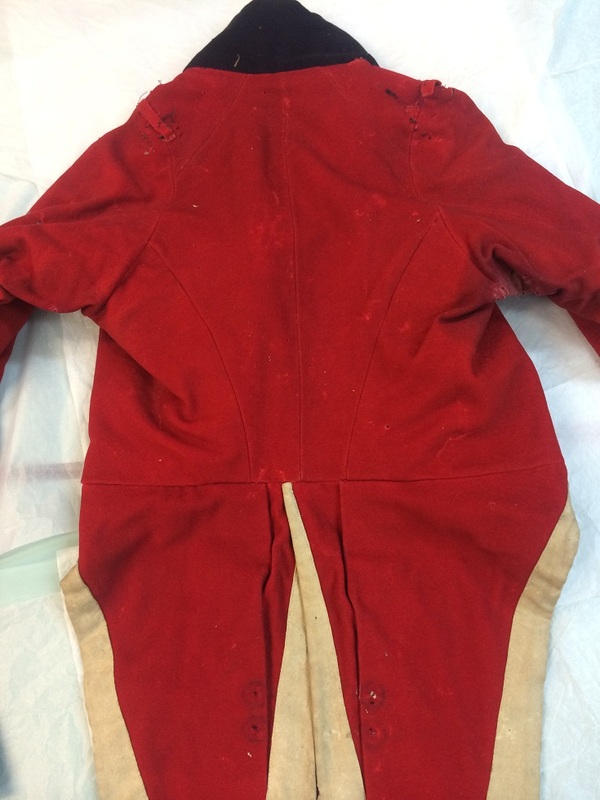 I recently had the opportunity to examine some coats belonging to the Bristol Volunteers of 1798-1802 and 1804-14. Like the other Napoleonic volunteer units which formed a sort of home guard for Britain during the French revolutionary and later Napoleonic wars, this regiment had a brief existence. Which makes the survival, of not one, but five coats belonging to members of the regiment very unusual, and these coats form a valuable resource for uniform and textile experts alike. The coat I was prepared to view on this occasion was intriguing because it had been mutilated post-period. Someone had removed half of the lining and buttons, allowing a rare glimpse of the internal construction- invaluable for those interested in studying or reproducing Georgian military tailoring. But there was another coat in the same collection at the Bristol Queen’s Road Museum that caught my eye. 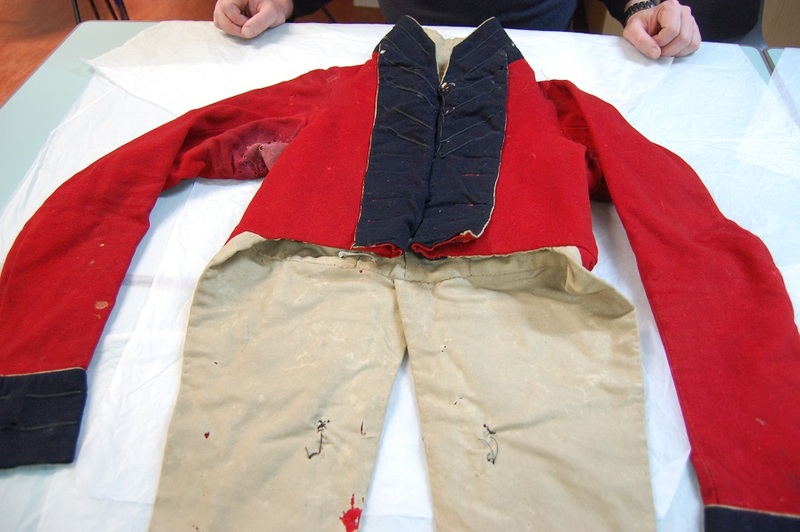 It is apparently also of the Bristol Volunteers in their later Napoleonic incarnation, and features a horizontal waist seam. This is unusual in tailoring of this period, so dating the coat became important. Apart from the waist seam, the coat is what you would expect of the period. 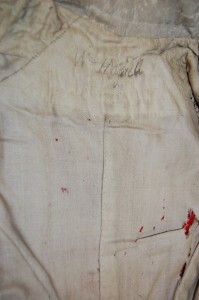 The under arm of broad cloth is heavily corroded by sweat from within. 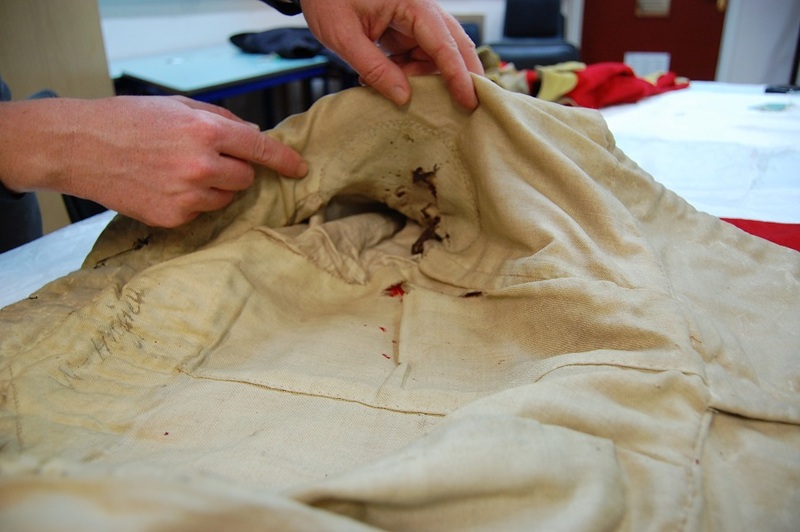 There is a contemporary repair to the lining consisting of cloth patches lined with very thin leather swatches. The coat is named to W Hassell. Being a Bristol lad, I have a soft spot for the Bristol Volunteers and have collected as much information on them as possible over the years. One of my finds was a copy of a 1798 work by a Serjeant James Brown of the 10th company Bristol Volunteers. It includes a complete list of the corps members to that date. Upon consulting this, I was pleased to find a Serjeant Wm Hassell serving in the second company. He is listed as Leather-factor, of Back-Hall. There is another Hassell in the same company, Private Robert Hassell, of the same trade in Somerset Square. So, what does this add up to? The uniform coat is part of a bequest to the museum that arrived via the National Army museum. It includes a bearskin cap, cap badge and cap lines of a grenadier officer, and in fact, the surviving coat tail emblems on this coat and epaulette fixings would affirm that rank and company. The suggestion is that Hassell received promotion post 1798. But why does this coat exhibit tailoring traits that one wouldn’t expect to see until decades later. In fact this is the fifth coat of this unit I have inspected, and the first to exhibit this peculiarity. It is also by far the most heavily worn example. Andrew Clarke of Military Metalworks has pointed out to me that elements of the turnback construction are the reverse of what one might expect. So did Lieutenant Hassell employ a novice tailor? The articles of the volunteers state that, ‘The cloathing of this corps shall be as little expensive as possible, (each member of the association being intended to provide his own) at the same time, it is expected to be strictly uniform’. So perhaps the tailor of Hassell saved money on cloth by the introduction of a waist seam that enabled him to use two smaller pieces of cloth rather than one larger. As always, close examination raises as many questions as it answers. At the end of this investigation I do feel as if I have got closer to William Hassell of Back-Hall. Not too close though- remember those terrible sweat marks.